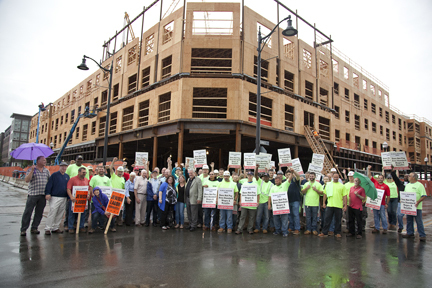 NERCC members and community leaders demonstrated against Callahan, Inc. on Tuesday at Assembly Row in Somerville, Mass. Union carpenters, other tradespeople, and community members heard remarks from NERCC Executive Secretary-Treasurer Mark Erlich; Somerville Aldermen Mark Niedergang, Ward 5; Matt McLaughlin, Ward 1, which covers the project; Senator Patricia Jehlen, 2nd Middlesex District; and Tim Toomey, Cambridge City Council, who spoke about the Policy Order unanimously approved the night before. 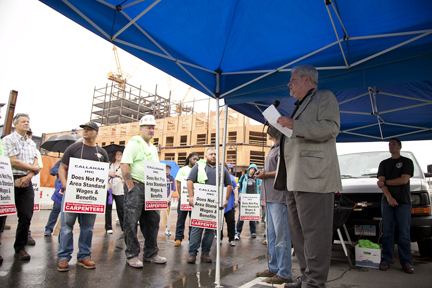 Before leading the group in a march in front of the Callahan project, Erlich remarked, "We're not talking about someone who is nonunion and we just don't like them. That's not the issue. We're talking about people who cheat as a business model. Cheat as a way of making money. Cheat as a way of undercutting legitimate contractors. Cheat taxpayers…That’s our objection."